I knew when I took on the jeans circle quilt project that it was big and that it would take a lot of work (no, it's not done yet!). But like any big project, it's also subject to project planning and constant reevaluation. One of my friends recently asked me what percentage of the project was finished. He's been spending way too much of his time doing project management in the last few years! But I was able to figure out that I was maybe 30% percent along at the time, after about 6 weeks. I've recently been spending a greater percentage of my time on the project, rather than just cutting circles while waiting for my kids at chorus practice and such, so it has been speeding up a bit. I've now gotten all the circles sewn together into three sections for easier handling going forward (in this picture it is 11 sections). However, having reached that milestone, I'm doing what drives project managers (and workers) crazy all over the world--dropping the project completely for a while while I focus on other projects. In the meantime, I did another favorite task of project managers: the prototype. I made a separate 9-circle square prototype quilt. I found a bandana similar to the tie-dyed sheet I'm planning to cut up, got the batting, got the fancy shiny variegated thread I'm planning to use, and put them all together. I tried out various stitches, widths and lengths of stitches, and so on. The prototype itself took quite a while (as they often do). In this case, though, it was very valuable to do the prototype (as it often is). I learned a lot from it. I wish I had done it sooner, as it has also opened up the project to a lot of reevaluation. Roughly translated, I hate the results of the prototype! As part of the reevaluation I've decided I hate the shiny variegated thread. It looks too busy with everything else, and it's slippery and extremely hard to work with. So I'll be going with navy blue cotton thread instead. I've also decided I want thicker batting, so it's back to the store for that, too. So once I get back to the project, I can pick back up on my project planning and keep my friends informed! What I still have to do is just cut up the colored fabric into squares for the other side, cut the batting too, and put it all together (I figure just arranging the fabric squares to a pleasing design will take me two or three days of work!). I spent the whole day today doing one of the things I enjoy most: teaching tie-dye to lots of kids. I was at my daughter's summer camp, Galileo Summer Quest, which is a new program here for middle school kids. It's not "school", but it's a seriously educational program. Kids spend time doing things like learning how to make digital movies (from storyboards to shooting to editing on the computer) and learning leadership and collaboration skills. 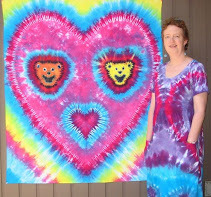 They also spend a period of each day doing more recreational activities like playing extreme hopscotch and foursquare--that's where the tie-dye comes in (besides, it is camp!). Galileo Summer Quest is a great camp for nerd kids--or kids whose parents want them to be nerd kids! Or both, in my daughter's case--(wipes away tear)--I'm SO proud! I'm a nerd too, of course. But the question arises: is there anything educational and intellectual about tie-dye? Absolutely! In my pre-dye lectures to the middle schoolers, I manage to sneak in just a little brain work. There's a little botany/biology: the Procion dyes bond to the cellulose in the cotton shirts, and where can you find cellulose? Cell walls in plants. There is a little chemistry in the reaction of the dyes with the soda ash (a basic solution) and the cellulose. And there is math: we spend time talking about how folds relate to the lines of symmetry, and how the stripes of colors relate to the folding, in the final design. We did X, V, stripe, and diamond designs. The kids (and counselors) really have to apply their spatial skills to wrap their heads around how the diamond and the X patterns come from almost the same folds. Who knew tie-dye was so intellectual? Galileo would be proud.